The NHL will take the next two weeks to turn Lincoln Financial Field into an outdoor ice rink. 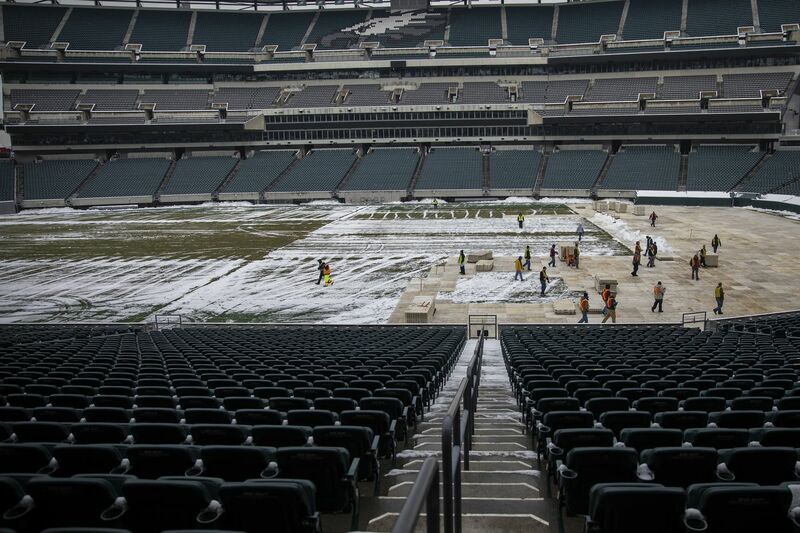 The snow-covered surface at Lincoln Financial Field will become a hockey rink in less than two weeks, when the Flyers host the Pittsburgh Penguins in the Stadium Series. The puck will drop for the NHL’s 27th outdoor game on Feb. 23 at 8 p.m., and the NHL has officially taken over the stadium and begun preparations to convert the field to a rink. The NHL has the world’s largest mobile refrigeration unit -- a 53-foot trailer-- that’s used to make the ice for the game. Derek King, the NHL’s senior manager for facilities and hockey operations, said it is the same unit the league used in 2012 when the Flyers hosted the Winter Classic against the Rangers at Citizens Bank Park. King was on that crew. Crews brought in a 53-foot refrigeration truck to help make enough ice to build the rink for Feb. 23's Stadium Series game. King said the initial preparations, up until Thursday, will mostly consist of connecting filters and pipes from the northeast entrance of the Linc to the field itself. The filters and pipes contain ammonia and glycol, which are the primary and secondary refrigerants, respectively, to help freeze the water. The water is added gradually in small increments to build a better foundation of ice. On Thursday evening, King’s staff will begin making the ice. He said it takes about a week to turn the rink into a playable surface. For an indoor game, the ice is built up to a thickness of approximately 1 to 1.25 inches of ice. An outdoor game requires up to two inches of ice to withstand any extreme weather patterns. That much ice requires approximately 20,000 gallons of water. The timing of King’s staff revolves around the weather. “If we’re going to have any sun during the day, we’ll just change our schedule to making ice during the evening when the sun is down,” King said. The 8 p.m. start time, compared to an afternoon start in the 2012 Winter Classic, bodes much better for pregame set-up. Overcast skies would be ideal conditions to manage the ice, but King has other plans in case game day calls for sun. The Flyers have won nine of their last 10 games and sit just six points back of the Penguins for the second playoff wild-card spot. A win tonight against the Penguins at the Wells Fargo Center could make for interesting possibilities come Feb. 23.